This Saturday, March 8, is a special day that’s near and dear to my heart, both as a woman and as an entrepreneur who has made it my lifelong goal to better the lives of others throughout the world. It’s International Women’s Day, and it’s a celebration of all of the amazing women who have helped—through social, political and economic advancements—make this world a better place for women. With a 2014 theme of “Inspiring Change,” this monumental day has me reflecting on the ways that I, and my business, are inspiring change in this world. 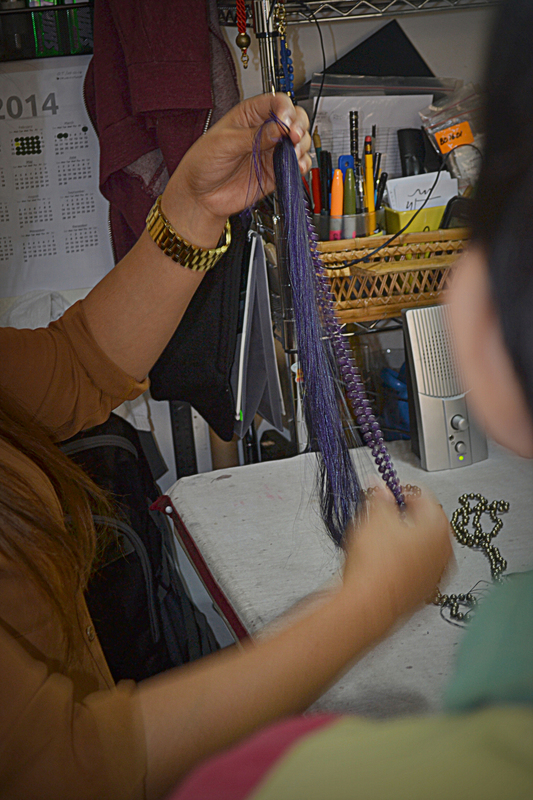 A Filipino artisan from our partnering co-op working to create mala bead necklaces for the Mala and Mantra line. When I began my soul’s journey to discover my next creative endeavor, I decided to shine the spotlight on some of my own core values: wellness, empowering women, sustainability and conscious creativity. I was born into a family of wellness practitioners, my father a physician and surgeon and my mother a registered nurse. I grew up surrounded by amazing individuals who truly cared for others and their medical and emotional needs. In my youth, I didn’t fully grasp or appreciate the magnitude of what my parents provided their patients, but I realize now that it was a nurturing and healing spirit. I was exposed to the modern wellness movement when I started working with the hospitality industry nearly 20 years ago. I am always seeking to find inner peace and spiritual inspiration, and being exposed to beautiful spas and resorts on a continual basis helped me to realize their potential for rejuvenation and peace. Empowered women have always been prevalent in my life, too, starting with my mother. She was a successful and highly educated medical professional; a supportive, loyal wife; a nurturing and loving mother; and the matriarch of a family—all things that have continued to amaze and inspire me throughout the years. I attribute many of my talents and traits to her and am eternally grateful to her for them. Sustainability was a concept instilled in me early in life, as my Filipino immigrant parents were always looking for ways to save and reuse everything. As a global citizen, I am greatly concerned about our environment and its resources, and I strive to find ways to achieve environmental sustainability in daily life. As an entrepreneur, I’m also concerned about the economic sustainability of those who are less fortunate, especially in underdeveloped areas of the world. As an avid supporter of the Fair Trade movement, I am constantly seeking ways to help artisans elevate themselves out of the depths of poverty. My new creative venture—jewelry and accessories line Mala and Mantra—is my way of combining all of these core values into one product, brand and endeavor. I’ve consciously created a line of fair, sustainable fashion jewelry, which I design with intention and consciously create with a co-op of Fair Trade female artisans in the Philippines. The line is inspired by Buddhist mala beads, which are a meditation tool used to achieve enlightenment and self transformation. In honor of International Women's Day, which takes place this Saturday, I am asking everyone to join me in recognizing and supporting the hard work and ingenuity of our world’s talented female artisans, and in fighting to make their creative endeavors both possible and successful. Whether you admire their work on our Gallery page or in the photo gallery below; read more about the co-op we’ve partnered with on our About page; or visit International Women’s Day’s website to learn more about this special day, we want you to honor the globe’s women and all of the amazing things they do and contribute toward making this world a better place.